An interesting article in JAMA Internal Medicine (February 2015) by doctors from Massachusetts, Maryland and California (A.B. Jena, M.D. lead author) analyzed mortality and treatment differences in patients who were admitted with cardiovascular pathology during dates of national cardiology meetings and compared these with the situation when the physicians were at the hospital. They found that high-risk patients with heart failure and cardiac arrest had a lower 30-day mortality rate when a national cardiology meeting was taking place. Fewer percutaneous interventions were performed during these meetings without an effect on mortality in patients with an acute myocardial infarction. Although the authors did not state this, one might (cynically?) think that treatment may have been excessive when the (interventional) cardiologists were "at home": perhaps bad for the patient and certainly not good for the cost of health care. In chronic wound care, unfortunately, the situation is quite often the opposite. 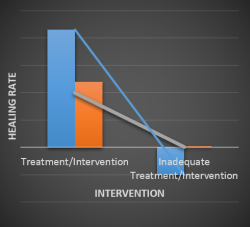 Instead of overtreatment, we so often see patients in whom intervention was non-existent, not adequate, not early enough and/or not aggressive enough. Most studies on venous leg ulcers for example include patients in whom the study-ulcer existed months before trial treatment started. If the results of the trial were positive (i.e. full wound closure or a positive healing trend) it is fair to conclude that treatment prior to study participation was inadequate (otherwise the lesion would have healed already). Similarly in diabetic foot ulcers, too many patients are only treated topically (if at all) without offloading or surgical intervention to correct Charcot foot pressure points. In many cases, pressure ulcers could have been prevented from going from stage I or II to stage IV if offloading and repositioning was done properly and frequently enough. In a recent chart review, I found a significant number of patients with diabetic foot ulcers and pressure ulcers that had been in existence for, literally, years without the underlying bony structures ever being checked for osteomyelitis. The solution to these problems is complex. Lack of reimbursement of proper dressings and offloading equipment is an important factor, as is the lack personnel in hospitals and nursing homes (who could regularly change the patients' position). However, the lack of knowledge on basic care for chronic wounds also plays a role. People who read this blog and those who go to wound care meetings such as SAWC or EWMA are, per definition, interested in wound care. Unfortunately, many people who "treat" chronic wounds are not, or they do not realize that proper wound care (using debridement, offloading, avoiding toxic topicals or dressings that damage the wound) can make a tremendous difference. Treatment of chronic wounds should be an integral and ongoing part of any curriculum for health care workers who come, or may come, in contact with these troubling conditions. Instead of reversing overtreatment to proper treatment, with enough training undertreatment might be converted to proper treatment for patients with chronic lesions. By doing so, patient quality of life will increase and cost of care may very well be reduced by shortening care and avoiding expensive complications such as amputations. Michel H.E. Hermans, MD, is an expert in wound care and related topics, trained in general surgery, trauma care and burn care in the Netherlands. He has more than 25 years of senior management experience in the wound care industry. He has conducted a large number of clinical trials relating to devices and drugs aimed at wound care and related indications and diseases. Dr. Hermans speaks internationally and has authored many published works relating to wound management.